Cartoon Network just released the third full-season installment of its most mathematical animated series on both Blu-ray™ and DVD as Adventure Time: The Complete Third Season hits retail. Continuing the franchise’s home entertainment momentum which has included a series of top-selling releases to date, the Blu-ray and DVD both feature all 26 episodes from the series’ third season, as well as must-have bonus features including episode commentaries for ALL 26 episodes, an interview with series creator Pendleton Ward, an alternate show introduction. Plus, further satiating even the most passionate Adventure Time fans, it’s BMO! Fans and collectors are in for a special treat with a custom die-cut BMO slipcase, which transforms the Blu-ray and DVD packaging into their very own collectible BMO figurine. Now available for the suggested retail price of $32.07 and $26.95 for Blu-ray and two-disc DVD, respectively. My kids were thrilled when they saw we got the chance to review Adventure Time. Filled with hilarious characters and story lines that keep my kids entertained, this is definitely a show your young ones will enjoy. I love that it keeps my kids busy and entertained and also love that my daughter and son both fist bump every time Finn and Jake do it on the show. This show is about friends hanging out and enjoying one another's company throughout the many adventures they get themselves into. After sitting down and watching a few episodes with my kids, the story lines are interesting enough to even keep me entertained and not moving from the couch. 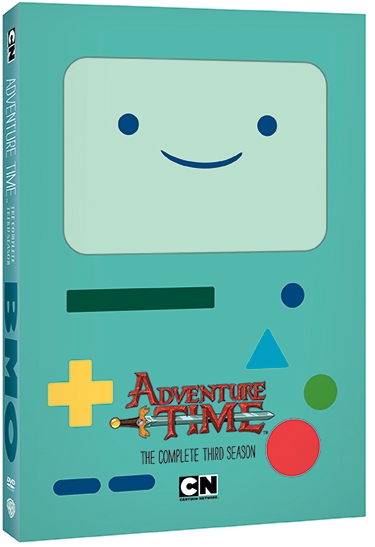 It also makes me laugh that my kids favorite character, BMO, (which was the cover of the DVD) reminds me of the old game boy devices I use to have when I was younger. Explaining that to my kids and seeing the look on their face was too funny. Filled with 26 episodes, Adventure Time Season Three is now out and available in stores for you to add to your collection. If you're unsure about the show or have never seen it, take a look at the clip below. It pretty much sums the show up. The gang gets into many adventures and try to get out of them. Disclosure: All opinions are my own. I received Adventure Time Season Three on DVD at no cost for the purpose of this review. No other compensation was received.